orange you lucky! 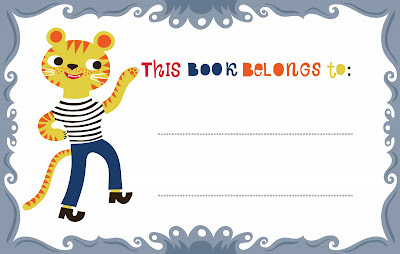 : hooray for books! Made these book labels for me (and the girls). but thought it would be fun to share with you all! If you click on the image - it will open up in its own window at a high resolution (true size). Copy that to your desktop and feel free to use:) If that doesn't work for you - e-mail me at dardikATsympatico.ca and I'll send you 300 dpi jpgs. Loving them! Thanks so much! these are stunning. i need some jar labels - i might just use these! thanx H! Isn't amazing when they start to read... Lily is still a bit confused as is learning in french + english, but we're getting there! thanks for the lovely book plates! I love kids' books! Thanks for sharing these labels. These labels are so lovely...thanks so much! I used to have labels like these in a lot of my books when I was younger! brings back the childhood memories! I'll have to put these in all of Roo and Jasper's books... so cute! Thank you so much for sharing Helen! I think these labels are wonderful! Very nice details and the characters are pure sweetness! Thanks so much! 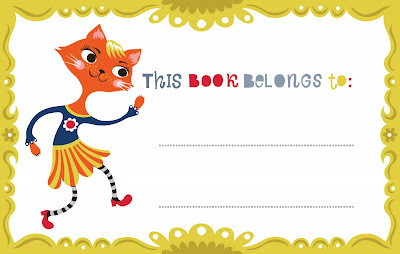 I love bookplates and always stick them in my children's books! These are fantastic. awwww I love this!!!! The colors are great! Check out my My Etsy Shop!!!!! I saved them and wanted to thank you for them. These are super cute and you are super kind. SO awesome, will link to on my site! you're so sweet! thanks for sharing! So adorable, especially that cat in striped tights. Too cute! How cute! Thanks for sharing them! these are so incredibly wonderful! and i'm so glad that i have just discovered your site and artwork... so talented! Thank you for sharing! They are lovely and remind me of why of love old school Golden Books so much, very funky! The stickers are adorable, even if they're no big whoop. I love your work in general. Just beautiful! Oh- THANK YOU! I just tried removing ink from a "this book belongs to you" signature (because, well, the book was originally for older brother, but now it's going to younger brother after being in storage for a couple years), and only managed to eat away some of the paper :( . These labels are lovely and will definitely be a treat in our christmas books! This blog is absolutely interesting!! I usually like to use orange juice in every thing. The orange have many properties, vitamin and antioxidats. This is the main reason why i consume a lot. Actually now, that my husband buy viagra i prepare for him recipe who contain many vitamin. cute labelsss....i also like to buy it.. They are lovely and remind me of why of love old school Golden Books so much, very funky! Thanks for that post! We are glad to find someone who puts a lot of thought into their blog instead of just throwing up a bunch of junk! Very nice post really impressive one, thanks for sharing.